When Google brought a host of improvements to its official Calendar App it wasn't too surprising to see the Android version get all the love at first, but now iPhone owners can finally make use of the new features as well. According to a post on the official Gmail blog, a number of new improvements will be coming to Google Calendar on iPhone. These include a 7-day week view and customisable week numbers. 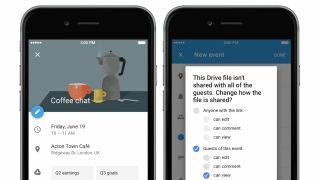 Google Drive files can now be added directly to events – and Google Drive can make sure that all attendees of an event have access to the files. Interactive notifications are also included, so you can email guests and view maps for appointments when you get notified of an upcoming event.